Planting, testing, watching, evaluating, tasting and killing. That’s the process of going from vine to wine. The creation of a new grape is a hard won, time consuming process. For more than 40 years the University of Minnesota Horticultural Research Center has grown hundreds of thousands of grape vine seedlings. Only hundreds of those have made the cut, been given a number and allowed to continue to grow. Only six grapes have been considered exceptional enough to be named — the newest is Itasca. John Thull (white shirt) harvesting grapes at the University of Minnesota, Horticultural Research Center research vineyard. “The art and science of growing grapes is a continuous cycle from last year to the next”, according to John Thull, the vineyard manager. In June you plant new seedlings and at the same time grow out seedlings from last year. Today more than 12,000 experimental vines are cultivated on 12 acres. The process of determining the potential of each vine is repeated every year. The decision to keep or kill is based on how the vine performs and the grape tastes. Thull is on a first name—or number—basis with every vine. It becomes a numbers game. Each seedling has the potential—a very small chance—to be the next best grape. Of all the thousands of vines tended and cultivated MN-1234 stood out among the others. It was bred with Frontenac gris (an earlier cultivar) and Itasca was born. The process started hundreds of years ago. Most wines today are from thousands of cultivars that come from European grapes (Vitis Vinifera). Only 60 species throughout the world are the foundation for the breeding programs —think Riesling, Chardonnay, Merlot, and Cab as well as all table grapes. Nature on its own creates grapes in the wild (Vitis Libresca) —smack your lips around grape jelly that makes the perfect PB&J. Vines have evolved all over the world. Here in the bold-north native grapes grow along fence lines, river banks and elsewhere (Vitis Ripairia) and were discovered over 150 years ago. Now if you have Vinifera, Libresca, and Ripairia you can grow all the vines. ‘Itasca’ grape variety developed by the University of Minnesota, Minnesota Agricultural Experiment Station (MAES) and released in 2016. Photo taken at the U of MN Horticultural Research Center, Chanhassen. The west coast grown European vines aren’t hardy enough to be sustained and thrive in severe winter climate. In the 70’s a grad student at the University of Minnesota found at least a hundred different Riparian grapes along the Minnesota River valley and those vines still grow at the U of M. The process of pollinating, breeding and blending began. They took Repairia-89 and bred it onto a French Landot-4511 and over years selected one grape good enough to be called Frontenac (formally known as MN-1047). The best laid plans of man are always trumped by nature and Frontenac had a natural mutation into Frontenac gris and has since mutated to Frontenac blanc and sometimes reverted back to the black version Frontenac noir which are found out in the field all on their own. Hundreds of batches of “test wine”!? So far the U of M has brought forth Frontenac, Frontenac blanc, Frontenac gris, La Crescent, Marquette and Itasca. The Itasca seeds came from 2002, finally went into the ground in 2004, and then took another 13 years to get to this stage for release during which time small batches of test wine (100 to 120) were produced and evaluated by Drew Horton, Enology Specialist at the U of M.
Matt Clark, University of Minnesota grape breeder, in vineyard at the University’s Horticultural Research Center. You’ll have to wait until the Itasca grape is picked in mid to late September 2019 to taste the fruit of all these years of labor. “It’s all about developing a new vine,” said Matt Clark, grape breeder and project manager. “The wines produced will vary depending on the vintner.” Clark works with 3 licensed nurseries in Minnesota, New York, and Vermont to sell the vines. Forty thousand vines were sold in 2017 so you’ll have a large number of vintners to choose from for wine tastings in 2020. Approximately sixty producers create wine from cold climate grapes and are joined by a number of eastern Wisconsin vineyards. Create day trips close to the Twin Cities or venture further afield over the weekend. Plan ahead, purchase a Winery Passport and choose form forty wineries to get ten wine tastings for $25.00. Go to www.minnesotapassport.com for more information. While all the local wineries plant many of the same vines, the weather changes, the soil, and the vintner account for a wide variety of wines. Plan a tasting, take a tour, join an event, partake in a stomp, celebrate the bold-north and enjoy the benefit of all those years of labor. 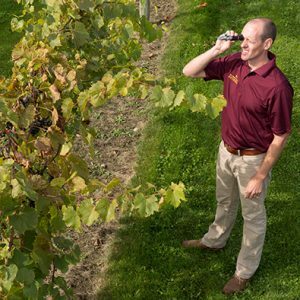 I highly recommend checking out events and classes on wine, winemaking, grape growing and much more are available through the University of Minnesota Landscape Arboretum at, www.arboretum.umn.edu, including classes led by Thull, Clark and Horton. Many of the classes are held onsite at the University’s Horticultural Research Center, giving you an inside look at where the innovation happens! My recommendation? Check out the introduction to home winemaking course coming up in March — whether you are an aspiring home winemaker, wine enthusiast or curious wine consumer you’re sure to have some takeaways! Jude Wiesner loves travel and has a deep interest in the written word. Her love for Minnesota wines takes her wine tasting around the state. She is the author of three short stories, as well as two published memoirs. As the director of outreach for the non-profit "Books on Wings", Jude works to get books in the hands of children at risk. Jude is active in the writing community as a member of The Loft Literary Center, WOW-Women of Words, Midwest Fiction Writers, and other writing groups. She is currently working on her second literary novel.